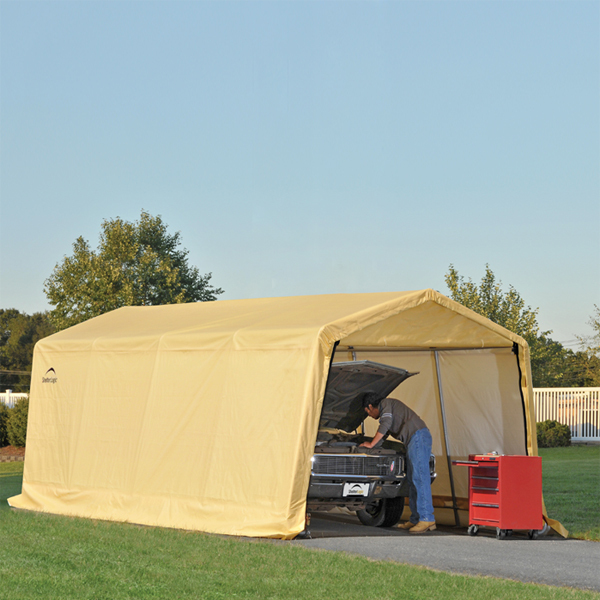 The Auto Shelter 1020 Portable Garage comes with a tan cover. You can store and protect your autos, ATVs, trucks and outdoor supplies. The durable steel frame has a diameter of 1 3/8 inches. The 10 Foot W x 20 Foot L x 8 Foot H frame features five ribs for extreme resistance to wind and weather. The cover is triple layered, rip proof polyethylene fabric. The fabric is water proof and UV treated. It is also treated to resist fading. 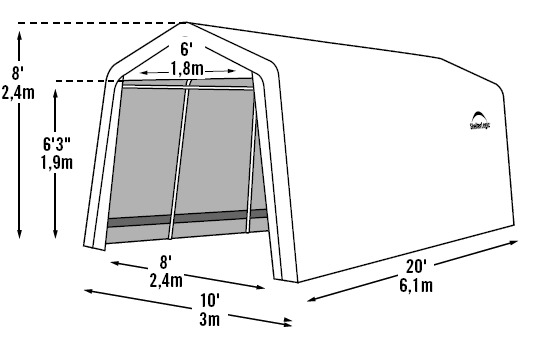 How much will the auger anchors that come with this ShelterLogic AutoShelter 1020 portable garage withstand? I'm thinking of buying two of these garages and I am curious about the amount of wind that they can take. With the augers turned securely into hard soil at their full depth, the canopy can withstand up to 65 MPH winds for short intervals. Where can I purchase a replacement cover? Can I get different color than yellow? We do not currently carry the replacement top for that item. You would need to get it from the manufacturer, Shelter Logic, directly. A good product, was able to set up frame by myself in two hours, needed help to put cover on. Read instructions fully before starting as you can save yourself time if you do. Some of the assembly needs to be taken apart to attach cover. Recommend ordering larger anchors if you live in a windy area. ProsAll connections are bolted making it easy for adjustment or to take apart later. The bottom rail get's inserted in cover after assembly, requiring disassembly again. Thought it would go up in a few hours, but ran into difficulties. Instructions weren't always clear and some parts were not labeled (ie: loops with plastic ends) finally figured out they were to hold roll up door open. Once it was all up it was very spacious and clean. We'll see how it holds up to the winter weather. Consnothing to dislike about this, though if it were a few bucks cheaper it help.